When it rains in Little Rock, our drainage systems can help keep your lawn healthy! Proper drainage is not only important for the health of your landscape; it’s also crucial for protecting your home or business. Little Rock Lawns owner Clark Carroll has 17 years of experience in the design and installation of landscape drainage systems. Little Rock Lawns has the expertise to design landscape drainage systems from small to large. We’ll design a system to fit the site and divert drainage around buildings, walks, driveways, and parking areas, using grading, contouring, drainage swales, French drains or a combination of appropriate elements to protect your home or business. Your landscape drainage system is important not only for convenience; it’s also crucial to protecting the value of your home. Water pooling around foundations or in crawlspaces can weaken foundations and cause moisture problems, including promoting the growth of mold and mildew, inside your home. When water regularly collects in areas with paving, it can cause settling and cracking of concrete. A properly designed landscape drainage system will divert or move water away from areas where it may cause damage, preventing the need for costly future repairs. Little Rock Lawns installs new landscape drainage systems of all types and can also repair existing systems. If your existing landscape drainage system is allowing water to pool where it’s not wanted, call us. 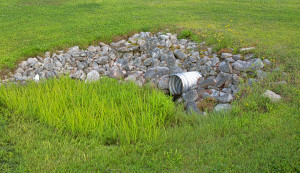 Landscape drains can collapse or become clogged with earth over time; Little Rock Lawns can pinpoint the problem, repair the damage, and send the water on its way. We’ll give you a diagnosis of the problem and a FREE estimate on repair. Little Rock Lawns provides quality, reliable, professional landscape drainage system design, installation, and repair for homes and businesses in Little Rock, West Little Rock, North Little Rock, and Maumelle. Call us today for a FREE site analysis and estimate. We’re locally owned & operated and are fully licensed & insured for jobs of all sizes.